As a singer (professional or amateur), you may be interested in improving your vocal skills with singing lessons. You want to be sure that your voice is healthy and your singing technique is solid and dependable. You may want to develop confidence, improve breath control, even build repertoire and style. Most importantly, you need to prevent vocal damage or eliminate existing vocal cord nodules, strain, or hoarseness. Your goals: to build range, power and projection, beautiful tone quality, and vocal stamina. 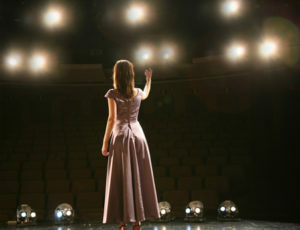 In addition, you’d like to develop your style, artistry, stage presence, and song interpretation. At our Center, your voice therapist and/or singing teacher will create a personalized program for total singing voice development. This is our “Singing Voice Mastery Program”. If you already have a vocal problem, we will include voice therapy techniques. We do this using our unique “Therapeutic Singing Lessons” program. Almost immediately, you’ll find that utilizing our techniques results in reduction of vocal strain and vocally-abusive behaviors. You’ll improve range, power, tone quality, and vocal stamina. Furthermore, you can master the breath control techniques that are the hallmark of great singing. Because we are licensed speech pathologists, we can also help you to improve your speaking voice. You can even reduce or develop an accent for acting roles. Our modern studio is equipped with electronic and digital keyboards, guitar, PA system, and professional accompaniment to simulate actual performance conditions. Audio and video recording capability is available on-site for feedback and evaluation of speaking and singing. All sessions can be recorded to CD or your own smartphone or MP3 device for home practice. Our singing teachers can help prepare students for auditions for college performing arts programs, NYSSMA festivals, musical theater productions, chorus solos, etc. In addition, we’ll help you to achieve excellence in sight-singing through our systematic Sight-Singing Instruction program. Read more about our NYSSMA Preparation, Audition Preparation, and Sight-Singing Instruction programs by clicking the hyperlinks. We are pleased to offer singing lessons in the comfort and convenience of your own home. Read more about this great option here. Furthermore, online singing lessons via Skype are now available. This is a great option when there is inclement weather, or when you are unable to travel to our Center. Speak to our Voice Program Coordinator for more information on scheduling Skype lessons or lessons at home. In conclusion, when you think singing excellence, think Professional Voice Care Center – the premier voice training and therapy center on Long Island!